Is Hollywood partly to blame for the high piracy rates of some movies? A newly launched website suggests that this may be the case, as it shows that the most pirated movies are not available to stream, buy or rent legally. While the movie industry has built its business on release delays, people’s viewing demands are changing rapidly up to the point where and Hollywood may want to reconsider its model. Every day millions of people download the latest Hollywood blockbusters though unauthorized sources. The movie industry is not happy with the ever-increasing piracy rates and has called out Google and other stakeholders to “do more” to help. At the same time, Hollywood keeps emphasizing the many legal options that are available to the public. 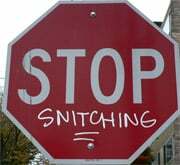 A few months ago the MPAA launched the website WhereToWatch.org which provides an overview of dozens of legal video outlets that are available in the United States. “Audiences want seamless access to film and TV shows. Our industry has listened, and we are now delivering more choices than ever before,” MPAA boss Senator Dodd said at the time. “There have never been more ways to access movies and television legitimately online, and those platforms continue to grow and develop thanks in large part to a copyright system that encourages innovation, risk and growth,” Dodd added. While this sounds great, the WhereToWatch site doesn’t change the fact that many of the newer releases are simply not available online due to artificial release lags. After a movie’s box office premiere it usually takes months before people can access it online. This mismatch prompted public policy researchers at George Mason University’s Mercatus Center to take a close look at the online availability of some of the most pirated movies. On the newly launched Piracydata.org the researchers use TorrentFreak’s weekly lists of most pirated movies combined with information from CanIStreamIt to come up with an overview of the availability of these titles. The results from this week are listed below, and it’s clear that half of the movie titles don’t have any legal options at all, while none are available for streaming. TorrentFreak talked to Jerry Brito, director of Mercatus Center’s Technology Policy Program and one of the people behind the PiracyData website. Brito tells us that the MPAA and RIAA complaints that Google is placing pirate search results above legal alternatives was one of the motivations to look into the legal availability. “We are compiling a dataset to help answer the question: Are the most-pirated movies available legally online? With only three weeks of data, the answer seems to be that very few are available legally. We’ll get a clearer picture in the months ahead as the dataset grows,” Brito says. The lack of legal alternatives they have found so far means that Google sometimes has no other choice than to place pirate sites high in the search results, as there simply are no authorized options available. “One implication may be that when movies are unavailable, illegal sources are the most relevant search results, so search engines like Google are just telling it like it is. That is their job, after all,” Brito says. 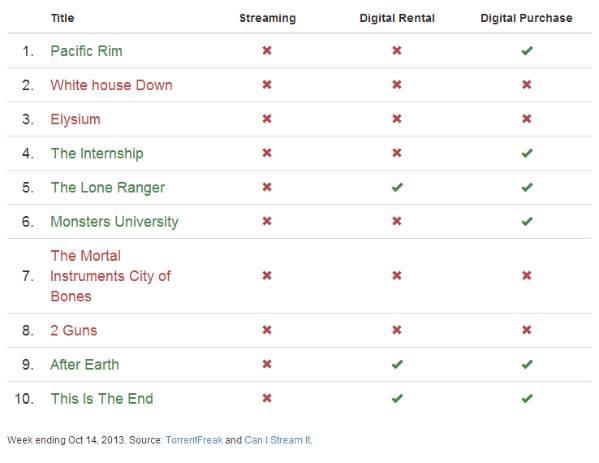 While the current dataset is limited to three weeks, it’s quite telling that of all movies listed none was available for streaming, while only 20% could be rented. Brito notes that the data doesn’t prove a causal effect between availability and piracy, but that it’s clear that Hollywood can “do more” to increase access to popular movies themselves. “They could make more movies available online and sooner, perhaps by collapsing the theatrical release window. Now, their business model is their prerogative, and it’s none of my business to tell them how to operate, but by the same token I don’t see how they can expect search engines and Congress to bend over backwards to protect the business model they choose,” Brito adds. Whether Hollywood will take up this suggestion has yet to be seen. Some movie studios have experimented a bit with shorter release delays, but unlike the TV and music industry it is still the core of its business model. Earlier this month H33t.com’s nameservers had been wiped from the domain records its domain registrar Key-Systems. The same now appears to be happening to the new .eu domain, as these nameservers have been deleted as well. Key-Systems previously confirmed to TorrentFreak they were forced to take this action following a local court order obtained by Universal Music Group. Since the German company is also listed as the registrar for the .eu domain, we assume that they have now been asked to “seize” H33t.eu as well. The new Obamacare website Healthcare.gov has had its fair share of problems over the past weeks, and the trouble continues. While using open-source software is fine, the makers of Healthcare.gov decided to blatantly remove all references to its owners or the original copyright license. 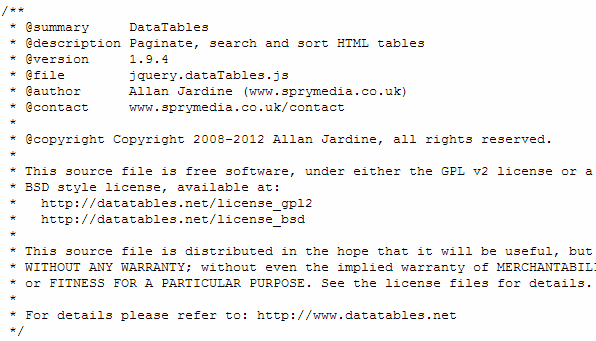 In other words, they simply took the open-source software and are passing it off as their own, a clear violation of the GPL v2 and BSD (3-point) licenses DataTables uses. For a comparison, here is the original DataTables file and this is how it looks on Healthcare.gov. SpryMedia, the company behind Data Tables told The Weekly Standard that they are “extremely disappointed” with the rip off and they will follow the issue up with the Department of Health and Human Services, who run Healthcare.gov.